With today's market close the S&P 500 Index and the Dow Jones Industrial Average both are in correction territory, down 10+%. The S&P 500 Index is down 11.15% from its closing high on 5/21/2015 and the Dow Jones Industrial Average is down 13.33% from its closing high on 5/19/2015. It is safe to say the bears have awakened from their worst nightmare as the markets moved higher, nearly unabated, for four consecutive years until this past week. 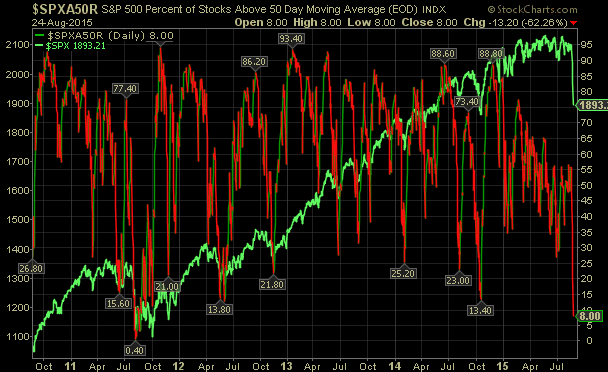 It is safe to say the market is in an extreme oversold position after today's trading activity. Nearly 90% of the stocks (444 issues) that comprise the S&P 500 Index are in correction territory, i.e., down 10+% from their 52-week highs. As we noted in a post this weekend, this figure stood at 70% after Friday's close, so more technical damage was done today. With today's close, only 8% of S&P 500 stocks are trading above their 50 day moving average as noted in the first chart below. This low percentage was last reached in August 2011 at a time the government's credit rating was lowered to AA+ from AAA by Standard & Poor's. 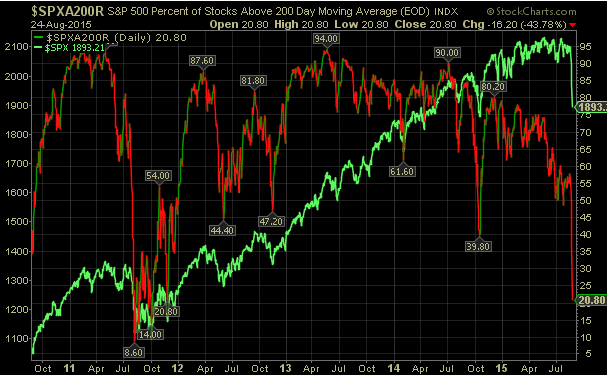 The second chart shows the percentage of S&P 500 issues trading above their 200 day moving average and this stands at 20.8%, again near a level last reach in August 2011. 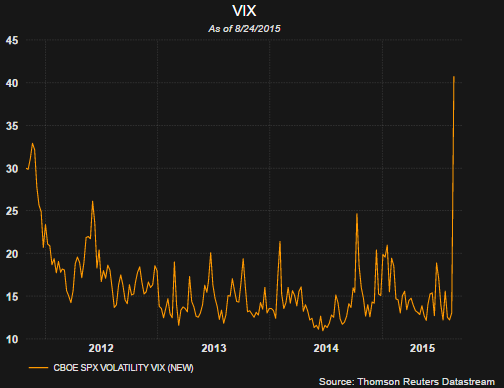 Another indication of potential excess fear in the markets is the level of the VIX Index. Today, the VIX spiked higher to 40.74. More insight into the VIX can be found in our article post from late 2011 titled, Fearful Investors. As I write this post the Shanghai Index is down over 6%, while the S&P 500 Index Futures Index is up almost 2%. Yes, there are challenges in the emerging markets, but we continue to believe developed Europe and the U.S. economies can withstand the impact of weaker emerging economies. Truth be know, China's historical growth has probably been much overstated for the past year and a half and developed economies have continued to experience economic growth, albeit slow growth. Now is likely a good time to follow Warren Buffett's often repeated quote, "Be Fearful When Others Are Greedy and Greedy When Others Are Fearful." The market action over the course of the last few days may not have shaken out all the weak hands; however, some markets and stocks are now trading at fairly attractive prices and valuations. No one can predict exact market bottoms, but the markets may be near a level where the bear trap shuts.